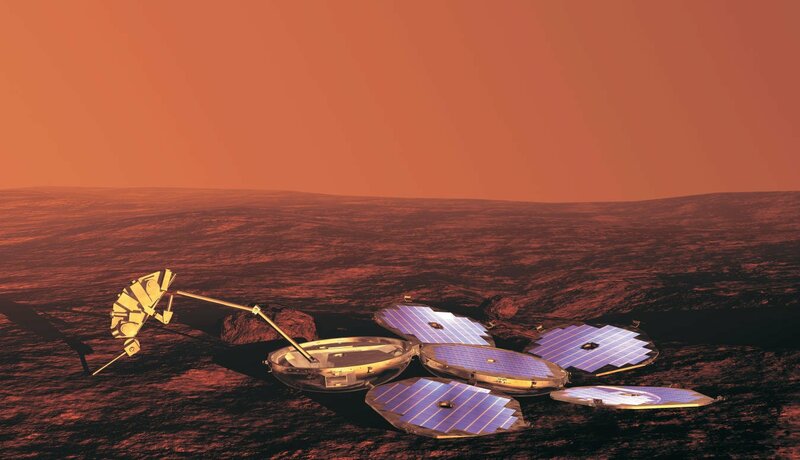 On Dec. 27, BBC Radio 4 broadcast an interview with Professor Colin Pillinger about the UK Mars exploration mission Beagle 2 which landed on the Red Planet on Christmas Day 2003. An MP3 of the interview is now available. Eight years ago, planetary scientist Colin Pillinger was still hopeful that the Beagle 2 Lander that he had spent years designing, building and publicising (with the help of Blur and Damien Hirst) might yet be found somewhere on the surface of Mars. But, as more time passed, it became clear that The Beagle 2 Lander would be forever lost in space. Jim al -Khalili talks to Colin Pillinger about studying moon rock and meteorites from Mars whilst running a successful dairy farm; broken space dreams and why, even if a space project fails, useful scientific lessons can still be learned. During the interview Colin Pillinger says that the biggest lesson learnt was not having had a radio beacon active during the decent phase and therefore not knowing what finally happened.